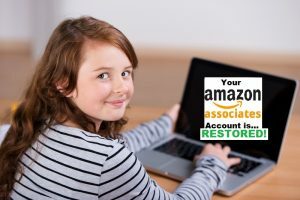 Online Music Store How To Restore Your Banned Amazon Affiliate Account? Amazon Associates is one of the best affiliate programs on the web, right now. If you are among the percentage of people getting started with Amazon Associates, it is essential you take time and read and fully understand it’s Terms Of Service. This is the only way you can keep your account safe and avoid the account getting banned by Amazon. Amazon can be ruthless when it comes to violations of their terms of service. They have strict policies and if you violate any of them, your Associates account is likely to get banned forever. They also have a zero-tolerance policy that helps them deal with the many scammers trying to take advantage of their program. You can appeal to Amazon if your account was banned,but the best thing you can do is accept and move on. It is pointless to complain and point fingers at Amazon saying they banned you unfairly, if you don’t know the reason behind why your accountwas closed. Mostly after your account is closed, Amazon will send you an email telling you the reason for the ban,but it is not always the best. You can email them back for clarification and they will explain the reason further. If you want your account reinstated, you will have to know the reason why because sometimes it is something you can fix. In most cases, the account might not be restored and Amazon gives you the option to open another account with the same email. Knowing the reason why the other account was closed will help you not to make the same mistake and have the account banned again. After knowing the reason why your account was banned, sometimes it is possible to fix the problem. If it was ignorance of their rules, this is not an excuse,but you can try and prove that you were innocent and see if they can be a bit lenient. However, it is good to be aware that another ban will definitely be permanent no matter the case. If it was a content related ban, try removing the content and ask for another review. Don’t lie that the content did not exist but just be honest about removing them. If you lie that the content never existed, Amazon will just check the cached versions of your site and see you are lying and you lose the chance to have your account reinstated. For link cloaking or cookie stuffing, this one you are going to have a hard time explaining. And sometimes the effort is not worth it because they will just cite their TOS and have the account banned forever. –	Explain that you have clearly read the terms of services and you are doing your best to comply. –	Explain that you understand where the problem was and you fixed it. If you were in violation of their policies, explain you understand you were in violation of the policies and explain the steps you have taken to correct the situation. –	Ask for clarification where you might not have understood and also ask if there is anything else on your site that you should take care of to prevent another ban. This should be a last resort if you are desperate for another account. This should only happen if you have tried everything to reinstate your account and Amazon has ignored you or kept the account closed despite everything. If you have to open another account, wait for a few weeks before trying to open another account. While opening the new account, make sure you change as much information as possible and interact with Amazon through a different IP address or a proxy. If you had your Amazon Affiliate account closed and you know the reason behind it is malicious. Just forget the account and open another one. Most of these accounts can be closed because of an email you did not read and it contained crucial information,but you just ignored it. It doesn’t matter how big your Affiliate account is or how much money you have in the account. It can get closed easily and sometimes you might not even be compensated for the amount that was in the account, especially if you had violated their policies.